I have a great giveaway going on here this week! Would you like the chance to win a pack of the new Stampin' Up blendabilities or a gorgeous photopolymer stamp set? Click here to find out how! LETS GET STAMPIN' AND STICKIN'! I've used the lovely, dreamy new in-colour, Lost Lagoon, for my card base today and both the designer paper strip down the side and the stamped sentiment are the same beautiful colour. It was lovely to get Everything Eleanor out again and use this gorgeous flourish. The simple flower is from Flower Shop. I stamped it with Lost Lagoon ink, coloured it with Coastal Cabana blendabilities (I really, really can't stop using these!) and cut it out with the coordinating Pansy punch. The card is finished with a sprinkling of gems, coloured with the darkest of the blendies. 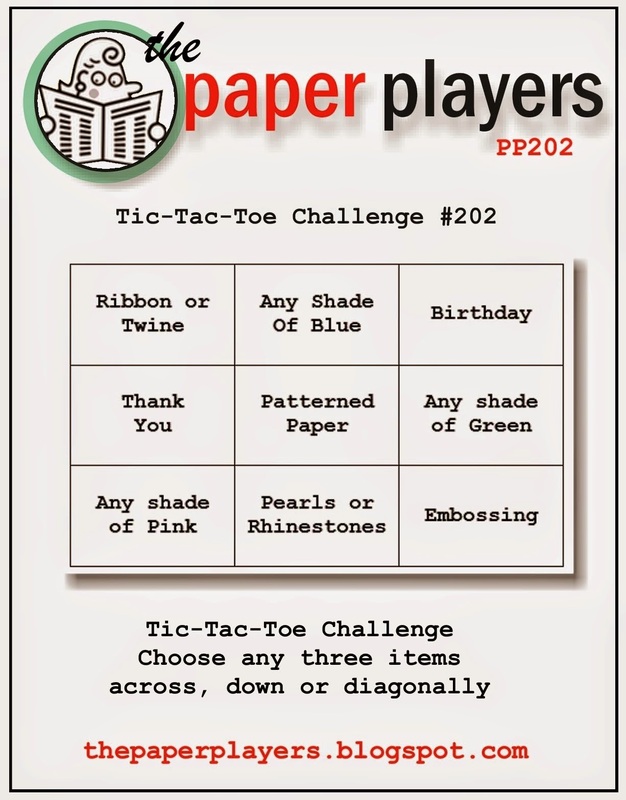 I was inspired today by the fun tic-tac-toe challenge at The Paper Players this week and I've inadvertently used both the middle column horizontally and vertically! Forgive me if I don't stay to chat today dahlings... I'm up to my eyes in diamonds! No, this isn't my outfit of choice for a supermarket run (!) - it's the sequin-tastic gown my daughter will be wearing at her prom this evening to mark the end of her school days. We'll be up to our ears in manicures, hair rollers, perfume and chiffon... oh there will be tissues at the ready this evening I can tell you! Beautiful card, love those colours. The prom dress looks very classy, good luck! Oh how wonderful Vicky. I'm sure your daughter will quite literally have a ball! Lovely card you've made too. Here . . . have a tissue . . .
Beautiful card Vicky, love the colour combo.